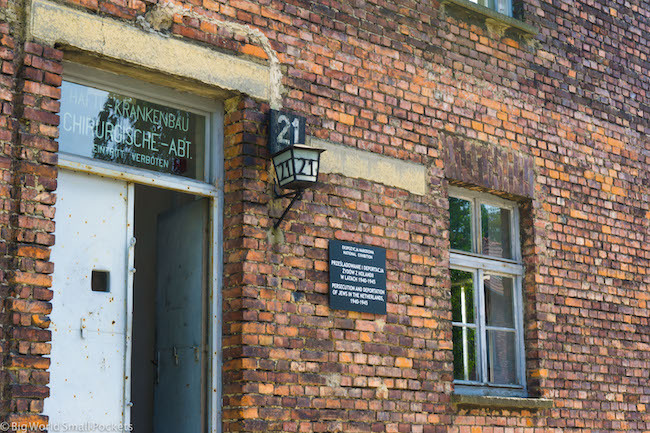 The sort of place you don’t necessarily get excited about going to, but the sort of place you feel you need to go to, visiting Auschwitz can be something of a moral gauntlet when it comes to travel plans. Situated in the Eastern European country of Poland, this is a place with a dark history, a place that has withstood the test of time to tell its sad, horrifying and graphic story. From that perspective, I do think its important to go and see this place, to bear witness to the atrocities and to remember them. If you feel the same, then here’s my practical guide to visiting Auschwitz for independent travellers. Most people visit Auschwitz on a day trip from the city of Krakow in Poland. Not only is picturesque Krakow worth a visit in its own right, but it’s also the closest major city to the Auschwitz concentration camp and therefore serves as a good base for those who want to visit this important site too. 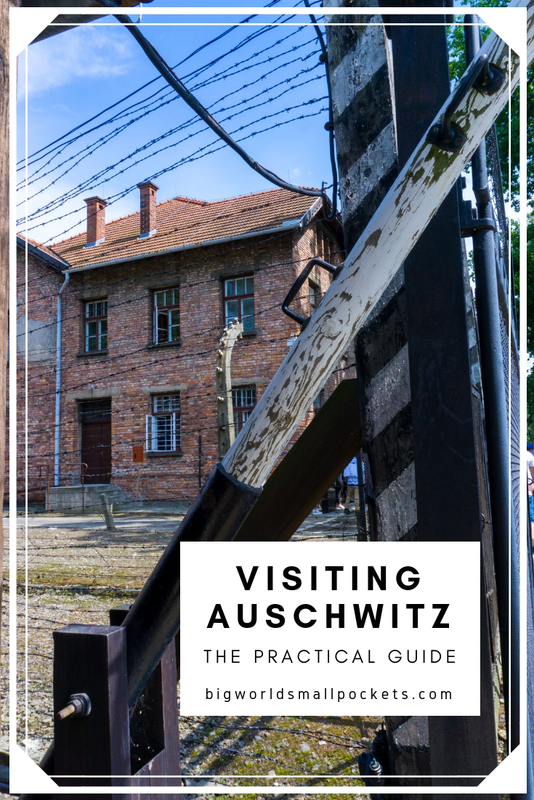 There are 3 main options when it comes to visiting Auschwitz from Krakow and because this is how the vast majority of people make their visit there, I’ve decided to concentrate this practical guide on them. Do be aware that Auschwitz really is a full day trip from Krakow. The drive there takes around 1.5 – 2 hours, as does the ride back. Plus you’ll need to allow around 4 hours to tour the site itself. That’s because there’s actually 2 different parts within the area known as Auschwitz. The first is the main area, or Auschwitz I – which was largely a concentration camp. 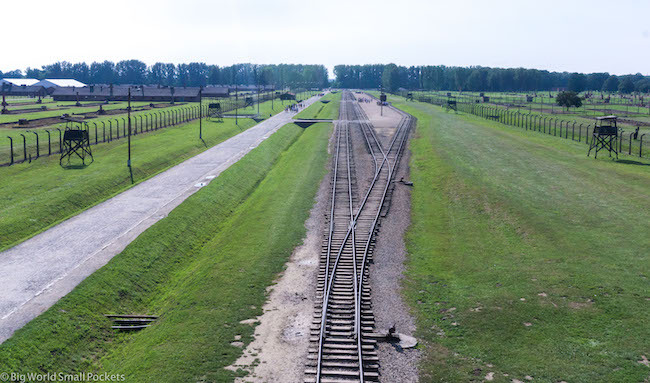 The second area is Birkenau – which was mostly an extermination camp and is known as Auschwitz II. Shuttle buses run between the 2 parts free of charge and tickets include entry to both. I’d suggest having a short break between the 2, because the unending litany of horrors can be a lot to handle in one unrelenting afternoon. Unsurprisingly, there’s no doubt visiting Auschwitz is an unnerving, emotional and intense experience. I’m not going to go further into how you will / might / should feel or what I felt visiting there either. I’m simply going to say I think it is important to visit and witness the horrors of the past to ensure the stories are not forgotten and repeated. 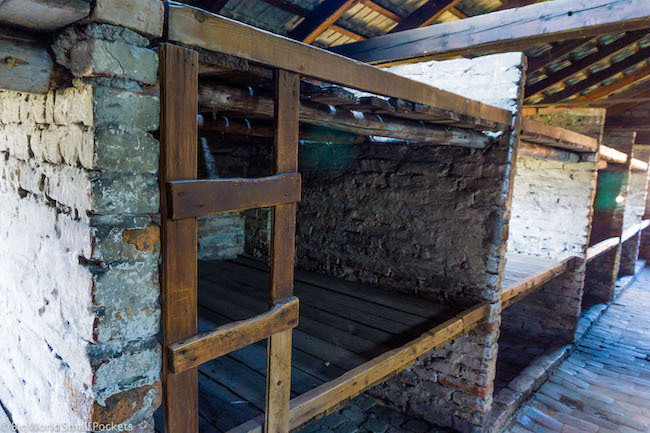 The rest of this article will deal with the practical dimensions of visiting Auschwitz. The easiest and therefore most expensive way when it comes to visiting Auschwitz from Krakow is to take a fully organised tour. If you’re feeling lazy, tired, are travelling with a family or like things easy, then this could be the option for you. 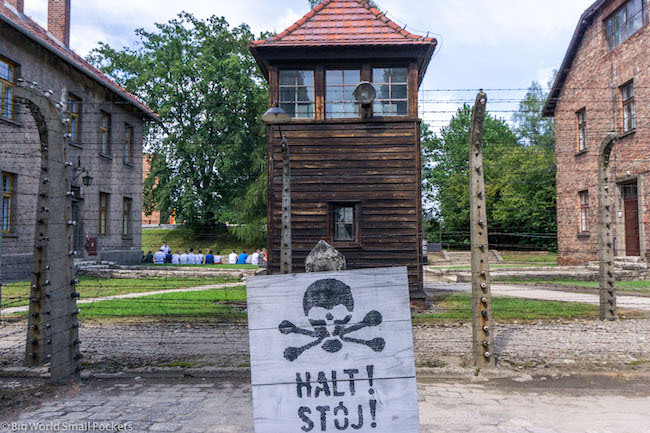 Normally including a private tour of the Auschwitz museum, transport to and from Krakow, as well as entrance fees and a guide, this is a one-off price that takes all the hard work out of arranging the trip for you. Instead you can sit back, let someone else do the legwork and spend your time learning about the events that took place here, rather than having your energy taken up the organisational elements of visiting Auschwitz. For a great selection of fully guided tours that run there at some very reasonable prices, check out Get Your Guide, who offer a huge selection along with the ability to check other travellers’ experiences and reviews. The second option for visiting Auschwitz is to take public transport to the museum from Krakow and then, when you get there, take a guide / tour to talk you through the site. The first thing to note about this is that you’ll have to book a guide / tour in advance – and in the summer if you want an English speaking guide, this could be quite far in advance! If you know which day you want to visit Auschwitz, I’d honestly advise booking your guide (or “educator” as the museum calls it) at least 2 weeks in advance. Entrance to the museum complex is free, but the guide costs a small amount. Here’s a guide to the prices you can expect to pay. 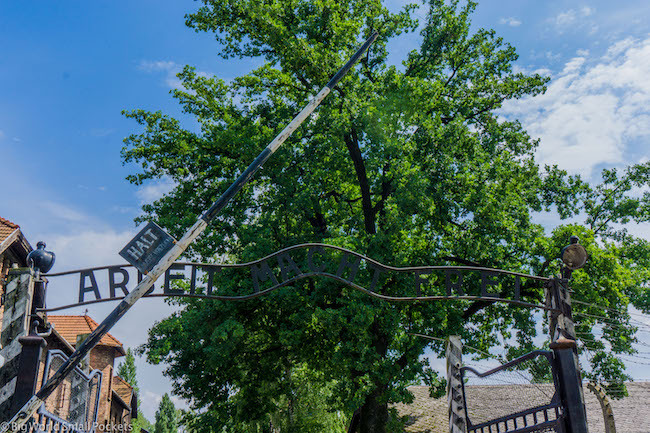 Booking can easily be made through the Auschwitz-Birkenau website – simply select a time for your tour and the language you want the tour in. Alternatively, you can chance it and leave booking your guide until the day of your visit. That said, chances are that in high season you’ll struggle to find an English guide / educator last minute and will likely get put in another language group with partial tour translation offered through a headset. If you factor in getting a bus from Krakow and the 1.5 – 2 hour journey time, I wouldn’t suggest booking your guide / tour for 9am! Instead, I’d opted for around 2pm, which was perfect as it meant I could have a lazy morning and also miss many of the crowds at Auschwitz, because the latter part of the day tends to be a lot quieter. If your tour starts at 2pm, I’d suggest getting to Auschwitz at least 20 mins before the start of your tour. That’s because on arrival, you’ll need to register, store any large bags, pick up your headset and get your tour sticker. As my tour was at 2pm, I actually got the bus from Krakow at 12pm, which meant being at the station in the city at 11:45am – see what I mean about this being a full day trip! It’s normally the number 14 Zolty Bus from Krakow’s main station that goes to Osweicim. This bus will drop you directly at the Auschwitz museum entrance. I’d arrive at the station in Krakow at least 15 minutes early to buy your ticket from the Central Office – not only because there’s often queues here, but because sometimes tickets run out. Also, my bus left early and didn’t wait for all the seats to be filled! Don’t buy a return bus ticket either, just get a one-way. That’s because there are many different buses back from Auschwitz to Krakow and you don’t want to be limited by a set return option when getting a ticket from the driver of any return bus is easy. When you arrive at the Auschwitz Museum things can be a little confusing – there’s lots of people, but no real directions for where to go! 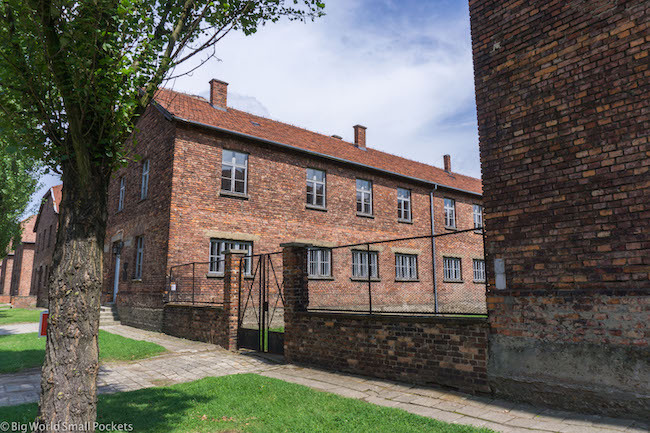 But don’t fear, if you’re visiting Auschwitz and have your tour booked, simply head to the Visitor Centre (the main building you can see opposite the bus stop) where you can use the bathroom and store your bag – this is a requirement for anything larger than a small handbag. 15 minutes before your tour starts you are allowed to pass through the far left entrance (if you’re facing the Visitor Centre) to clear security, collect your headphones for the tour and meet your guide. Your tour will include a visit to both Auschwitz I and Auschwitz II (Birkenau), as well as a short break and the shuttle bus between the 2. You’ll then be taken back to Auschwitz I at the end of the day, from where you can catch a bus back to Krakow from the same stop you were dropped at. #1 Good Camera – You will be pretty much snapping non-stop during your time in Eastern Europe and will need a good camera to do this gorgeous part of the world justice. I highly recommend the Sony A6000, which I use for all my travels and love, not least because it’s light, compact and robust! #2 Good Walking Shoes – There will be a lot of walking in Eastern Europe, it’s as simple as that! Make sure your feet are comfortable therefore with a pair of New Balance Trainers. Perfect for stylish city strolling and sightseeing, I love mine! #3 Good Guidebook – I’m still a massive fan of the Lonely Planet Guidebooks and do think their combined Eastern Europe edition is well put together. Able to save you a lot of money if you want to learn about the history of this part of the world, but not continually pay for a guide, getting the eBook is a great way to keep your luggage weight down too! #4 Good Water Bottle – All that sightseeing is thirsty work, so make sure you have a metal water bottle that you can refill as you go, because Eastern Europe tap water is generally safe, drinkable… and free! #5 Good Backpack – And to carry your water bottle, camera and guidebook, you’re going to need a decent backpack that will help you balance the weight as you walk and sightsee. In my opinion you can’t go past the Bobby Anti Theft Backpack, which is also perfect for helping you avoid pickpockets. #6 Travel Insurance – And finally, I wouldn’t go anywhere in the world without proper coverage and always recommend travel insurance from World Nomads as the best option when backpacking Eastern Europe and beyond. And finally, you can see Auschwitz fully independently by getting a bus from Krakow and then touring the museum by yourself without a guide or tour. This is free (outside of the bus fare) so maybe the best option for any real shoestring travellers among you. That said, even as a hardened budget traveller myself, I’d really suggest visiting Auschwitz with a guide / tour, because you’ll be able to appreciate the magnitude of what you’re seeing on a whole, new level. I seem to have visited quite a few “dark” tourism sites this year (unplanned and unintentional) but I can tell you that from the Holocaust Museum in Jerusalem to the Genocide Memorial in Rwanda, Auschwitz was by far the most powerful for me. Perhaps this is because you’re physically walking through the location where the atrocities you’re hearing about happened – it’s undeniably more real and visceral as a result. Yet, Auschwitz was the only 1 of these 3 sites where I took a guide and there’s no question it greatly enhanced the experience for me and was well worth the small extra expenditure. 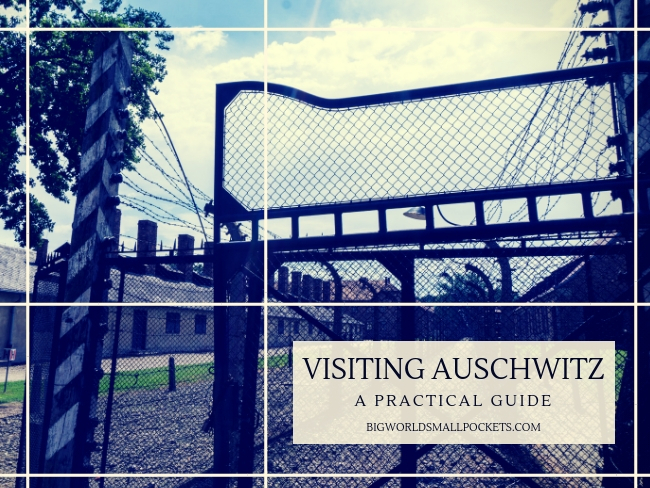 So that my practical guide to visiting Auschwitz. Have you visited this museum? Please do let us all know if there have been any updates to the above information about going to see this important museum.